I’ve always said that the best bubble warnings are the earliest bubble warnings, because society needs as much lead time as possible to take action to prevent the bubble. Early bubble warnings also give individuals and families time to prepare for a coming bust and deep recession. Just think of how many people lost their homes, businesses, and jobs during the U.S. housing bust 10 years ago: don’t you think they could have benefited from an early warning?! Of course they would have! It’s common sense (which is not so common, unfortunately). “You’re a permabear!,”You’ve missed the bull market!”, etc. This is flat-out wrong: I foresaw and warned of the coming debt and bubble-driven bull market in early-2012 in great detail. I said that we were likely headed for a huge bull market, but it wasn’t going to be a sustainable economic boom, but one that leads to a depression when it pops (which is still ahead). “You’ve been calling for a bear market all along, but the market keeps going up!” – Yes, there will be a tremendous economic crash when this false economic recovery/bull market ends, but I’ve always said that you need to “trade with the trend, not against it” (if you must invest or trade). I have said this probably hundreds of times throughout the years, yet I keep receiving the same criticisms over and over. People simply do not listen. I’m at a complete loss as to how to communicate my ideas so that everyone clearly understands my positions. I think people just assume – without paying attention to the important nuances and caveats – that I’m a stereotypical “bear,” which means that I’m calling for a crash at all times. Lately, I’ve been hearing the criticism “you’ve been warning about this bubble for 10 years now! When are you going to admit you were wrong? 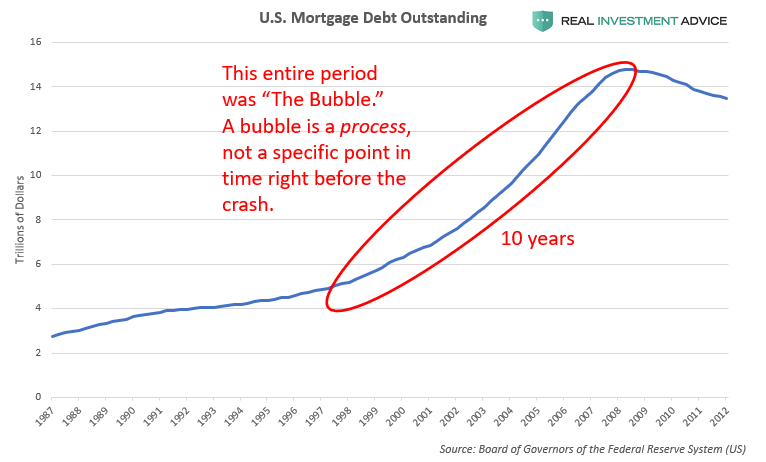 !” Yes, I know it’s been seven years (I started warning about the current bubble in June 2011), but even warning about a bubble for ten years isn’t crazy at all – for an example of this, we only need to look to the U.S. housing bubble, which inflated from roughly 1997 until 2007. I believe that someone would have been completely justified for warning about this disastrous bubble for a full decade. Just imagine the kind of criticisms that would be leveled in the latter stages of the bubble in 2005, 2006, and 2007 at someone who had been warning about the U.S. housing bubble since 1997! They’d probably want to hide under a rock, yet they would have been completely correct. I believe that the current bubble is no different. The chart below shows the U.S. housing price bubble from 1997 to 2007. I believe that bubbles are a process rather than a specific point in time right before they burst. The U.S. housing bubble was actually a bubble even as early as 1998 and 1999, just like the current “Everything Bubble” was a bubble even back in 2011, 2012, and 2013. A bubble is differentiated from a sustainable economic boom and bull market because of what drives it: cheap credit (typically due to central banks holding interest rates low), rapid credit growth, asset overvaluation, rampant speculation, “fool’s gold” booms in various sectors and industries, and the “gold rush” mentality. Sustainable economic booms and bull markets, however, are driven by technological and scientific advances, rising productivity, improvements in governance and regulation, society or the world becoming more peaceful, individuals and corporations saving and investing for the long-term, debts being paid down and improving credit ratings, and so on. Similar to housing prices, the U.S. mortgage bubble inflated from approximately 1997 to 2007. While someone who warned about this credit expansion for ten years would have been written off as a total crackpot in the latter stages of the bubble, there was a method to their madness. If society had actually paid attention to those early bubble warnings, the ultimate crash would have been far less severe or may not have happened at all. Today’s bubble will prove to be no different: if society had listened to people like me back in 2011 and 2012, the coming crash would be far less severe. Instead, people like me are currently being labeled as crackpots, even though everything we’re saying will make complete sense in the next crisis. Contrary to the two charts above, the two charts below illustrate how the mainstream economics and financial world thinks about bubbles: they think you are only correct if you warn about a bubble immediately before it pops. How does that make any sense? To me, it’s completely counterintuitive, but I’ve learned that the mainstream world really does think this way based on my interactions with them and the criticisms they keep hurling at me. Wouldn’t you want to try to prevent an economic crisis as early as possible? Of course, but they just don’t see it that way. The greed encouraged by the speculative bubble completely blinds them from seeing the truth. They can only think in terms of their Profit & Loss statement and tactical market timing signals – ie., if you warn about a bubble, that means that you’re calling “THE TOP,” right here and right now. Heaven forbid you’re slightly early, your financial career and reputation is basically ruined. The chart below shows the U.S. mortgage bubble and how the mainstream economics and financial world thinks of it. While I believe that the best bubble warnings are the earliest bubble warnings as an anti-economic bubble activist, I obviously don’t approach trading this way! As I explained earlier, I believe you need to trade with the trend, not against it (if you must trade). You should not short early on in a bubble, otherwise you will get destroyed. Again, this is common sense and I’ve said this all along, but people automatically assume that skeptics like me are short all the time. Anti-economic bubble activism is a completely different discipline from successful trading, and this is why people are often confused by my message and position. The chart below shows total U.S. system leverage vs. the S&P 500. Rising leverage or debt is driving stock prices higher and has enabled the so-called “recovery” from the 2008 – 2009 crash. I have been warning about this bubble since 2011 and I am proud of it. If I could go back, I would warn about it even earlier – in 2009 or 2010. Every economist should have been warning about it. Each year that has passed since the 2009 bottom, leverage continues to increase, which means that the next crash is going to be even more extreme than 2008 was. Thanks to the current phase of the bubble that has inflated since 2009, the U.S. stock market is as overvalued as it was in 1929, which means that a painful mean reversion is inevitable. How did the market get to this point? It did so by inflating in 2010, 2011, 2012, and so on. Had society listened to people like me who warned about this inflating bubble back then, the market would not be this overvalued. Now, a massive bear market and financial crisis is “baked into the cake” or guaranteed. Right now, with the market as inflated as it is, greed is the dominant emotion by far. Most economists, traders, and the general public only see Dollar signs right now, not the extreme risk that we’re facing as a society. In their minds, the greatest risk or “crisis” is to have missed out on the bull market. Anyone who plays the role of a naysayer and warns about these risks gets shunned. It is really “uncool” to be an economic skeptic right now, but I’m an unusual person – I don’t care about being popular or cool; I care about doing what’s right, which is warning society against dangerous inflating bubbles. I believe vindication is not far away.